Is this S-R reporter committing 'old-fashioned plagiarism' or just aggregating? Longtime Spokesman-Review outdoors reporter and editor Rich Landers has for more than 40 years written about everything from bear spray guidelines to rafting season in Idaho. But what readers may not realize is that while many of his stories are thorough, well-reported pieces of journalism, the award-winning journalist and well-known regional outdoors expert has also repeatedly presented other writers’ work as his own. Over the last few months, the Inlander has found several instances going back through 2016 where pieces “By Rich Landers” did not give credit to the source of quotes or entire sections of prose. 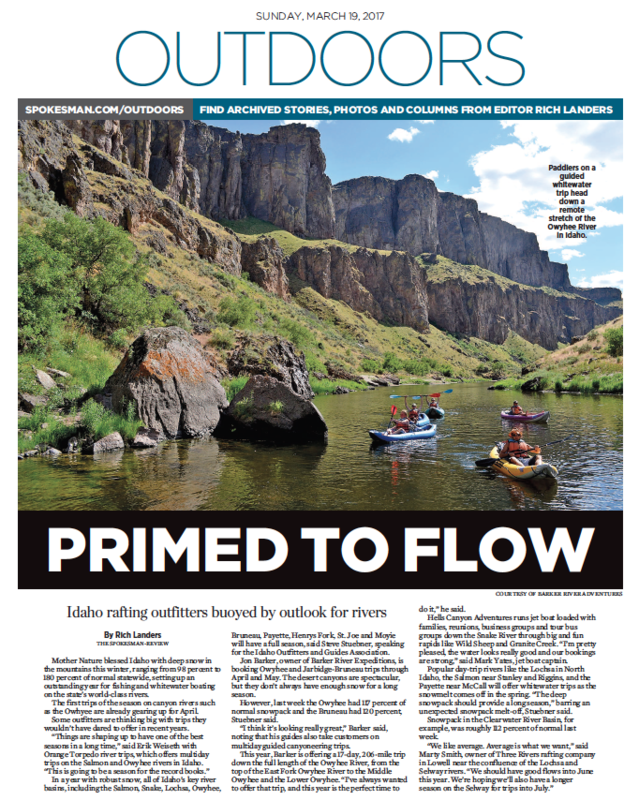 Most recently, the Spokesman-Review published on Sunday a story under Landers’ byline about Idaho’s rafting outfitters getting excited for the upcoming season. In fact, 355 words of Landers’ 458-word article in the Sunday Spokesman-Review were reproduced verbatim from the association’s piece, including quotes from four people who the association interviewed but Landers apparently never did. What Landers' rafting story looked like in Sunday's Spokesman-Review. Journalism professionals who were shown examples of Landers’ articles that appeared to have copied previously-published sources say that Landers committed a cardinal sin of journalism: plagiarism. “It certainly looks like old-fashioned plagiarism,” writes Indira Lakshmanan, the Newmark Chair in Journalism Ethics for the Poynter Institute. "With a young writer, I might assume ignorance of appropriate standards, but Landers has been at this far too long, in my view, for that to be a valid excuse." But journalism professionals agree, attribution is needed throughout a piece, not just in one place. "In cases where language used is exactly like that used elsewhere, or close to it, I tell students that they should always attribute the source (with quotation marks, if exact language). No one expects a reporter to be an expert on every issue. It is a strength – not a weakness – to cite other sources clearly and coherently," writes James McPherson, chair of communication studies at Whitworth. "With a young writer, I might assume ignorance of appropriate standards, but Landers has been at this far too long, in my view, for that to be a valid excuse." In the case of the rafting story, Landers says he added enough information to the piece for it not to go under the byline of the association. "I can’t remember another time ever that I used the lead from a release, but this one worked and I went with it. I changed and added qualifiers to the media release such as the possibility of quick snowpack meltoff – enough that it couldn’t be under the byline of the IOGA," Landers writes. "That said, the information in the story was attributed to the outfitters or Stuebner." The examples of copied text found by the Inlander include more than just sections of writing that’s been lifted from press releases, which some could argue are, by design, meant to give reporters material to use. 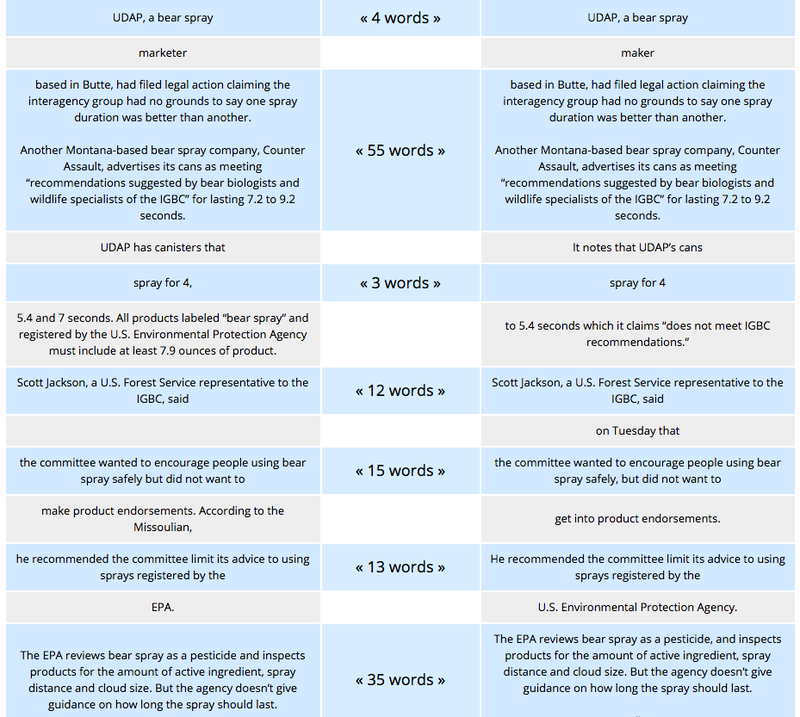 Back on Dec. 18, readers who saw Landers’ piece on recommendations for carrying bear spray might not have realized that full paragraphs of that piece had already been published in The Missoulian five days before. In that case, Landers attributed two paragraphs of reporting to The Missoulian, and did expand the story with original reporting, but the piece heavily lifted sections of reporting without attribution. Journalism students are taught early on that when someone reads a quote in an article, they assume the writer spoke with that person. To not cite that someone else did that interview is deceiving. When it was pointed out that a piece credited to Landers about a pack horse surviving for six weeks in Wyoming used quotes, without attribution, from a report in the Jackson Hole News & Guide, Landers said the report had improperly been pulled from his blog. Often in the Outdoors Blog, Landers, like many reporters compiling materials for online posts, will summarize a story from another publication, link to it, and paste some or all of the story into the blog, but clearly indenting the text to indicate that entire portion comes from another source. In print, that distinction is lost. The Spokesman's managing editor, Joe Palmquist, defended Landers in a written statement this afternoon: “I have worked with Rich Landers for 28 years. He has the highest regard for original reporting and recognizes the value of those stories to our readers. On a daily basis, the news media uses published stories to localize and edits them (shorten or expand), but Rich Landers always gives credit to the original story and publication. Regarding press releases, every day, the news media does indeed read, refine, check and use information from press releases.